Regarding your problem, did you calibrate the maximum movement positions for the manual gimbal axis in the Naza Assistant software? From Multirotor Pilot Issue: by Petr Hejl Lift the copter at the tips of opposing pairs of arms and see if it stays balanced. Multi-rotor One-power Output Fail Protection In most conditions, the whole multi-rotor will retain good attitude and rotate around the frame arm with no power output, due to imbalanced mechanical structure and external environment. Toggle the switch and observe the slider position of channel X2 on the assistant software screen, the corresponding area should turn blue. 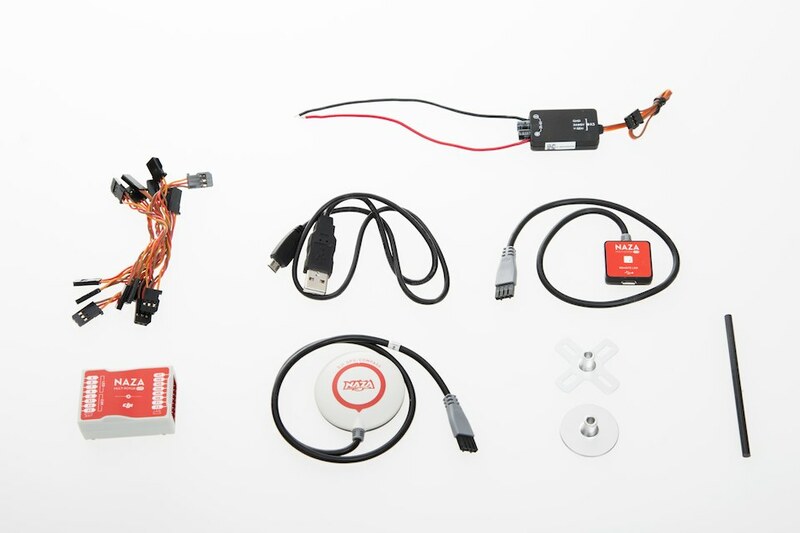 The X1 value and channel is meant for manual gimbal control if your remote features more channels and the desired channel cable is attached to the X1 connector of the Naza. The gimble is connected to F2 of the Naza. Check the declination and readjust it if you travel further away from your usual flying area. Using the traditional wiring setup. Built-in Gimbal Stabilization Function The gimbal stabilization module is compatible with almost all 2-axis gimbal systems servo driven gimbals. The m-lite uses a stripped down firmware and assistant software, so a lot of features a just not usable with the entry level flight system. I used double sided foam tape to secure it to the aircraft, just like I did with the receiver. Do you know how the switch acts normally? Power cycle the autopilot system, note that power cycle is required. Even at the minimum throttel its keeps climbig. Very nice conclusion on the F550 with Naza Wolf! If signal lost for more than 3 seconds failsafe will be triggered, if signal regained within 3 seconds it will exit failsafe immediately. Hello Roberto, thank you for your comment. Switch on the transmitter first, and then power on the autopilot system. If the module is installed too close to the battery, the copter will behave very unpredictably and will be extremely difficult to control. The pilot can switch between the three modes to achieve different flight characteristics. I am using 3s and they are fully charged! Intelligent Orientation Control Usually, the forward direction of a flying multi-rotor is the same as the nose direction. The new algorithm gives better stabilization, automatic compass compensation, and a new take off mode more on that later. For some reason this message always appears during advanced calibration up to the 2. Any advice to get this thing going would be appreciated. Bus, but works well with a standard receiver also. First of all, an important factor is your weight to prop to thrust ratio, I had an issue using 3S batteries that my drone was just too heavy for them to handle it correctly. Refer to the FailSafe section for more details. Still waiting for the Armaflex tube to arrive to re-coat my landing gear skids with better foam tubes. This is a cheap one from HobbyKing gifted to me by Yakoda, another multicopter flying furry friend. The good news for V1 users is that the new software used in the V2 version is also available to V1 users. 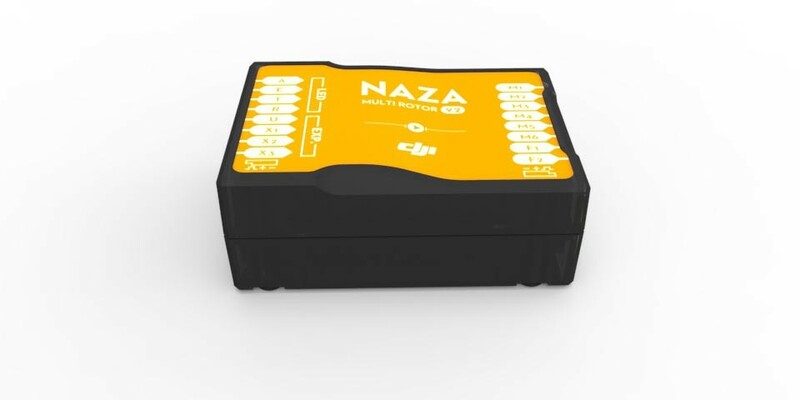 Using Futaba 10J transmitter and r3008sb receiver with the naza v2 flight controller. Now select your set fail-safe menu on your Graupner remote and let him record your actual 3 way switch position. Depending on your channel selection of the transmitter you have to find the matching channel on your receiver. Motor Disarm: There are two modes of Motor Disarm: namely Intelligent Mode and Immediate Mode. Hi, after flying heli fuel 60 size for many years, manual mode was all we got. Hello Rainow, thank you for your comment. When payload is heavier, rotating speed is faster. Simply lift the copter at the tips of opposing pairs of arms and see if it stays balanced. The first level will blink the red light continuously; the second level will blink red light continuously and the multi-rotor will descend and land. Thank you very much for answering. Regarding your questions, here could be several situations at hand. The real fun comes in Manual Mode, but I would no. Got everything hooked up down loaded the naza frameware programmed my naza, I did the motor test on the computer and everything worked fine. If I may ask, which port do you have your light plugged into and is there something special I need to do to get them to work? Is there maybe a way to calibrate your Turnigy switch? Even when the multi rotor is rotating, using Course lock or home lock mode will allow you to move the multi rotor in the corresponding Transmitter stick direction. And I use channel 6 to the u on the Naza, ch 5 to my 3 way switch set up as Gear. Otherwise could you provide more information? But I am not able to run the motors with my transmitter. The real fun comes in Manual Mode, but I would not suggest that til you really learn to fly good and do it on quad. See the following figures Mode 1 In home lock flying, the forward direction is the same as the direction from home point to multi-rotor. Mode and Manual Mode position to regain the control. It is only the Course Lock or Home Lock that neither works at all. Two Levels of Low Voltage Protections In order to prevent your multi-rotor from crashing or other harmful consequences caused by low battery voltage, we have designed two levels of low voltage protection. There are also other masts available. 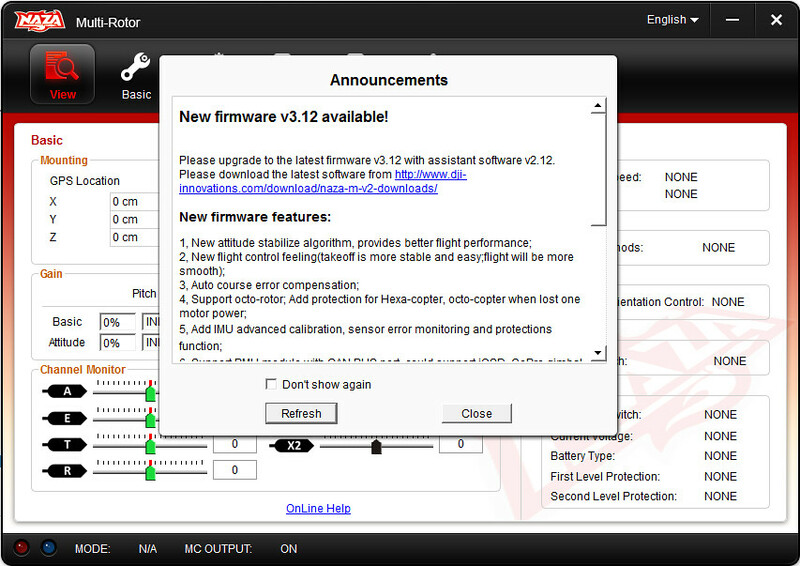 If there is a firmware version more up-to-date than your current version, you will be able to click to update them. Alternatively you can use screws to fasten the bottom of the mast to the frame. On the turnigy, you can have it either on, off or flashing, depending on how you short the pins. If all 8 motors don't work in sync it will flip over and crash like you are talking about. It had been some time since I last setup a Naza and like all things, if not done frequently, I forgot in which order they needed to be done. Leave at least three inches of distance between the module and the battery. If your battery is mounted to the top of the center plate, choose a location as far away from the battery as possible; best near the edge of the frame on either side of your battery pack.